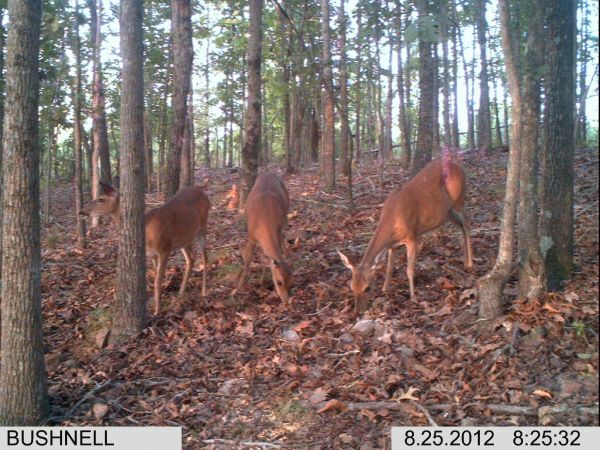 Test your deer hunting skills.10 second rule- how many deer do you see? Good luck in your deer hunting this year and make sure you post your big bucks. Everybody loves to see big mature bucks in South Carolina. Make sure you check your tree stands for bad straps, rotten wood,loose bolts and screws, and red wasp. Opening day in the upstate can be a dangerous outing if you don't do your home work. Think Safety and let a friend or a family member know where you are going. 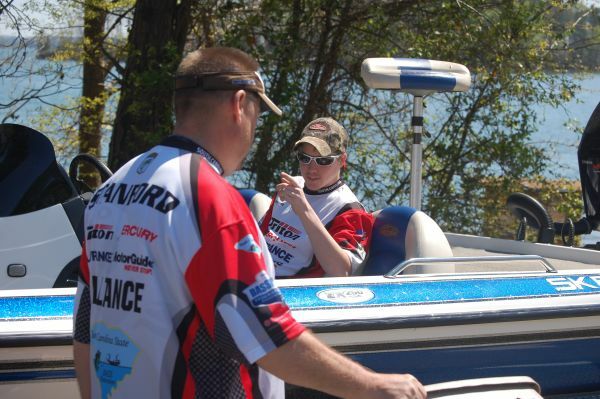 Take a kid hunting and fishing! Smallmouth bass are down in number this year. We are hardly catching any smaller bass, thanks to the blues. But big smallmouth are still there and you can get lucky and land a South Carolina prize. Tubes are working good along with a white fluke, buzzbait,spinnerbait and small crankbaits. Early in the morning, they are biting better on topwater and flukes. With the water down, look for the deeper pools where the main river runs close by. Please pratice catch and release. This is a delicate river system. With deer season quickly approaching, Club Members are trying to get food plots planted, salt licks refurbished and checking stands for a safe hunt. In the upstate there are a few acorns falling with the hot summer temperatures and shortage of rain fall in the last few weeks. Salt licks are getting pounded and the corn feeders are running dry. Get your practice in with a bow and good luck. 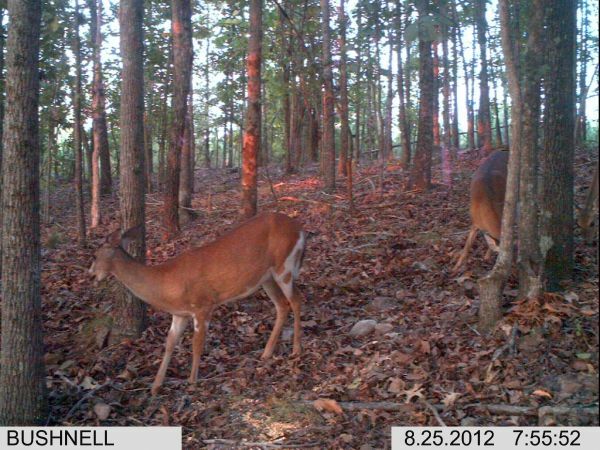 Lets see some of your deer camera photo's. Big blues are showing up in the Broad River system and they are getting big fast. 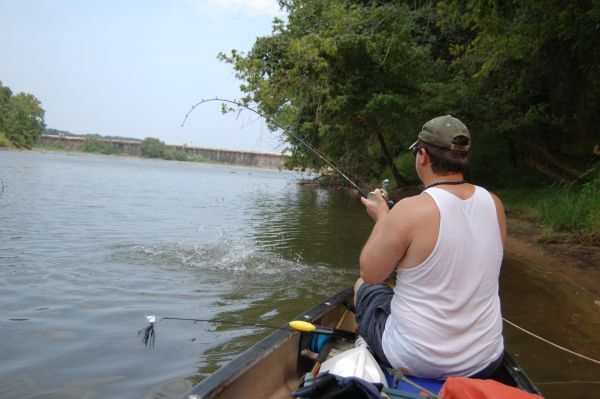 Are the blues eating the smallmouth and largemouth bass? I sure think so. The places we've been smallmouth fishing for years have been on the decline in a big way. The blues are fat and very healthy. So we are catching big catfish up to 25 lbs in the lower section of Broad River. Sonnys and Doc's dip bait is a good choice in all South Carolina lakes and rivers. We use pool noodles on a short carolina rig with about a 1 inch long piece. We use yellow, red, blue, and purple colors. Send some of your catfish pictures and stories. Most of the anglers top baits of choice were a Zarro Spook and Zoom SuperFluke at the mouth of some of the big creeks around standing timber in 20-30 ft of water. 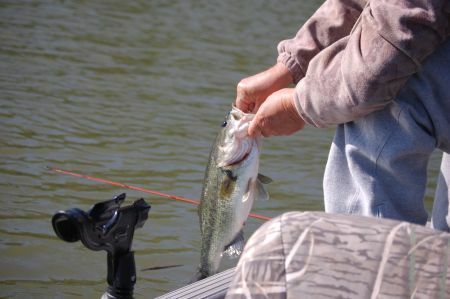 The spotted bass seemed to be at the lower end of the lake around deep, rocky points on a shakey-head worm and a Carolina rig. 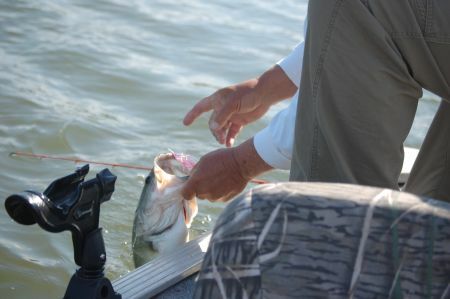 Some anglers reported seeing schooling fish and some of the bigger fish were caught that way. 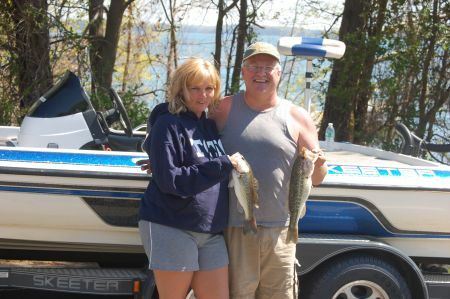 Fishing report- the crappies are in deep brush piles, 12-15ft on the main body of the lake. Try using minnows on a dropshot rig and small crappie jigs. The brim should be in the same depth of water around brush using night crawlers. The bass are hitting topwater baits early in the morning around covered docks on the deeper banks. A floating worm around the lily pads seems to be working well for most anglers. The bass are schooling the first 30 minutes of daylight the last few weeks, out on long points in the ends of shallow flats, 12-17 ft. of water. Try throwing a Zoom fluke and a light weight texas-rig worm in those areas. The shellcrackers are in 10 ft of water in front of the spawning brim beds. Night crawlers should be your best option. At Lake Bowen the last few weeks, there have been some good quality fish beinging caught out on the long points and humps that are scattered in the main river channel. There have been some 15 to 21 pound stringers being weighed in on the Thursday tournament. The big bass are biting big crankbaits and spinnerbaits in 10 to 20 feet of water around big bait balls. The old carolina rig is still hard to beat this time of year. 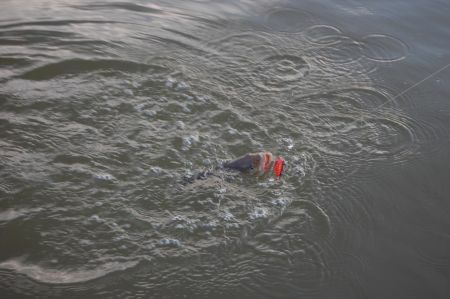 Right at dark try throwing topwater baits around shore line structure. What do you like to throw this time of year? Bream fishing is great this time of year. This week there are a lot of bream on the bed. Grab a small rod and a couple of hundred crickets, take a kid and have some fun. Most of the bream beds are in the back of small coves, and if that does not pan out, look for a big over hanging tree and you are bound to have some action. 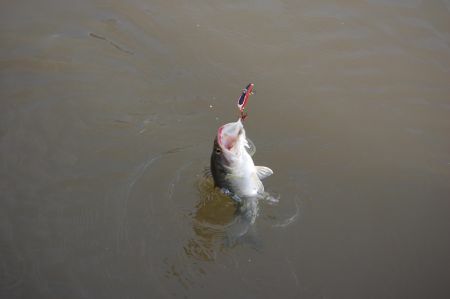 The big catfish have moved out of the shallows and are in the creek channels hunting bait balls. 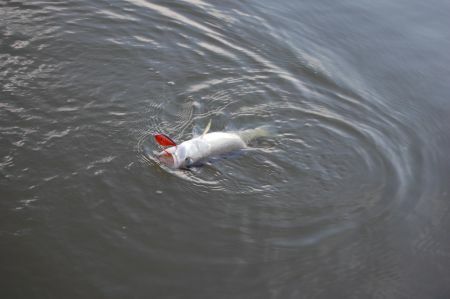 Drifting cut shad should produce some nice size catfish. The crappies have moved out of the spawning pockets and are staging around 5 to 9 feet on brush piles. 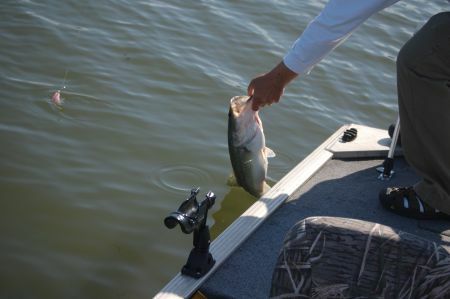 Bass fishing is hit-or-miss but your best bet is early in the morning or late in the afternoon. Lake Lyman fishing has been very good the last two weeks. The numbers of fishing being caught have gone down but the size has made up for it. I know of at least one fish over seven pounds that was caught this week on a floating worm. Fish topwater early in the morning and shady docks when the sun comes out. At the Lake Bowen tournament this week, 13 pound won first place, but it went down as 5lbs won second place. Topwater baits are the key for the last few hours of day light. The carolina rig will always put some bass in the boat. Bass Fever is in the air. Congratulations to my close friend Marty Robinson for this big finish at the Lake Murray Bass Master Elite Series. Marty finished 14th place. And, a couple of other Carolina boys showed out- Mr. Casey Ashley and Mr. Lake Murray, Davy Hite. The Zoom Fluke was the bait to use this past week. Lake Bowen has been a little tough the last few weeks. With the bass in their post spawn funk, it makes for some tough conditions. Ten to twelve pounds have been winning most of the tournaments. A Carolina rig is hard to beat when conditions are tough. Use top water early in the morning. Some of the time, you have about a 2 hour window to be successful, so you better make it happen quick. 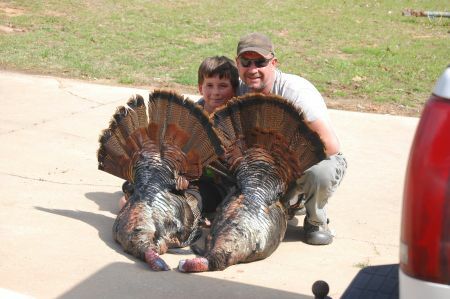 Upstate turkey hunting has been a great year for the Jackson family. Mr. Travis L. Jackson and son Hunter had a good day in the woods bagging two big toms. 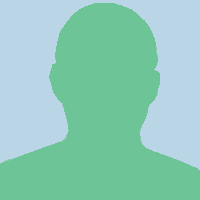 Travis is a long time outdoorsman spending every available time he can outdoors. Whether he's fishing in his pond, on the big lake, chasing wild turkeys, deer, hogs and ducks, he trys to spend time with his boys in the great outdoors. Mr. Jackson says if you can keep them outside you can keep them off the streets. Building your relationship with your kids can really influence their life, and maybe they will take their kids fishing and hunting too. 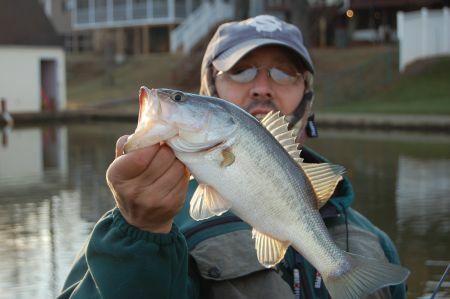 Hot bass action on all local lakes make bass anglers very happy. What are the bass doing? Some are pre-spawn, others are spawning, and some are post-spawn. What more can you ask for? What ever you like to do, you can do it. 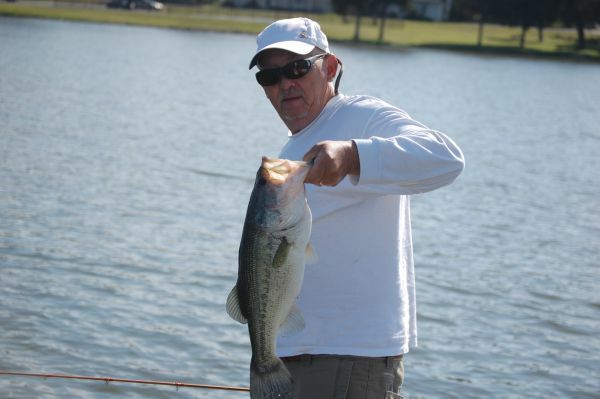 Topwater action, Shakey heads,crankbaits, and even some good sight fishing can be found on most area lakes such as Lake Bowen, Lyman, Cooley, and Blalock. It is a fishermans paradise out there. So, good luck and keep those pictures rolling in. Turkeys in the south- how great is that? The population this year is awesome. 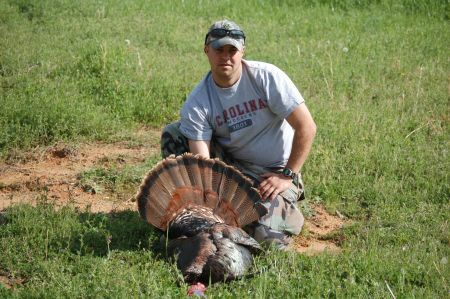 So many turkeys in the upstate make for some great hunting. 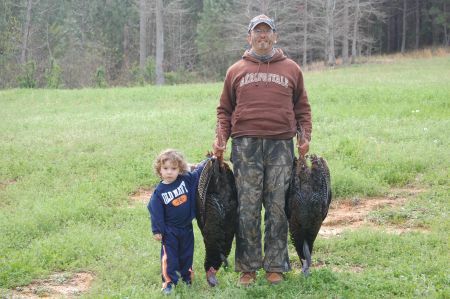 A few hunters in the Upstate make it happen with two big birds. Jamie and Rob say to never give up. 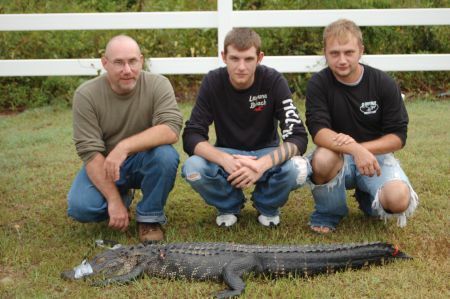 Their big Toms came later in the day, when most hunters would call it quits. Know your hunting areas and turkey movements to really help you get the job done. Opening day for me went way better than I could imagine. I got off work at 7:30 in the morning went to our hunting club and signed in. Luckily, no one was signed in for the the spot I wanted. I headed down to get set up so I could put some of my best decoys out, and make a few calls. About an hour went by and there were no turkeys in sight. By now the time is around 9:30 and I hear a gobble in the distance. Looking out of my blind about 200 yards away, I see 3 long beards looking at my decoy. Within 3 minutes, the turkey were on top of me. I quickly put on my face mask, grab Old Faithful, put the bead on the biggest Tom and pulled the trigger. And to my surpise, two big gobblers layed flopping in the food plot. What a day- I limited out in my hunt club for the year. Back to fishing. How was your open turkey day? You never can tell what wildlife you are gonna find around a pond! 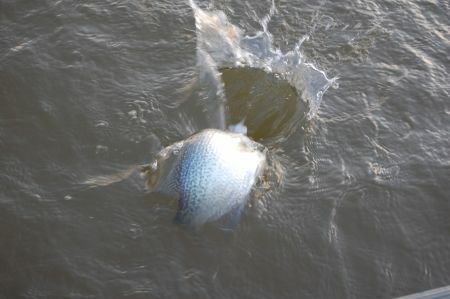 Lake Bowen, Lake Cooley,and Lake Lyman fishing reports for crappie fishing have been on fire. The crappie's have finally moved up on the shallow brush piles in 5 to 7 feet of water. The water temperature is a steady 60 degrees and they are biting. The best set up is a small crappie jig with a cork and a three foot leader. With the water clarity stained, the crappie are preferring chartruse color. The bridges are still producing some nice crappie around the columns closer to the bank. Good luck fishing and send us some photos of your nice crappie stringers. Big Fish- JMcDaniels and Mike McDaniels- 7.81 lbs. The fishing on Lake Murray was pretty tough, a lot of the guys caught fish on a carolina rig worm, Green pumkinseed, trick worm and a lizard. Later in the day the fish moved up shallow around docks, where a jig-n-pig combination was the deal. The Southern Sportsman Spring Classic 2011 Lake Bowen, S.C.
What a day to be fishing in pouring down rain and cold winds. This is the biggest tournament of the year for the Lake Bowen boys. We wait all year for this tournament. The weights were down from last year but with a cold front and rain, there were still some nice catches out there. First place had about 19 lbs, second place 16, third place had 15, fourth place also had 15 lbs and 5th place had 14 pounds. 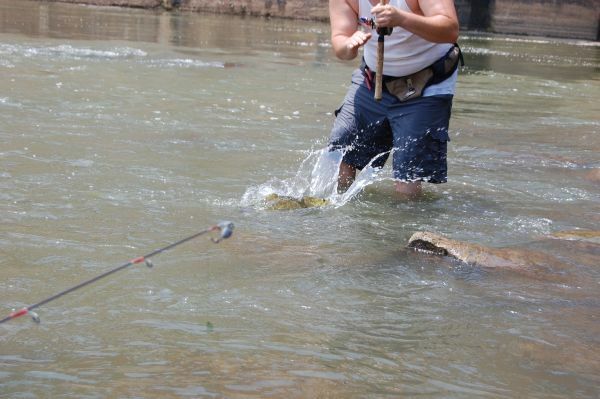 The biggest fish was 6.90 and it was caught on a floating worm. A lot of fish were caught on a spinnerbait and a jig. There were also some nice fish caught on crankbaits. With 65 teams on the lake, the points and coves had people crawling on top of each other. It was hard to find a spot after the first hour of fishing that somebody hadn't already been fishing. How did your local tournament fishing go? Lake Bowen has been very tough these last few weeks but some of the lake's big bass are starting to move up and fisherman are catching them. A big spinnerbait, slow rolled, is the ticket. Also, a jig around brush piles and around docks are also a good technique. 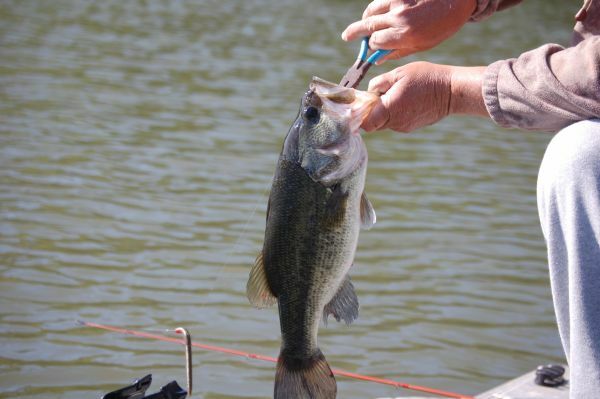 Lake Bowen's big fish tournament was Saturday and there were some nice fish caught. A seven pounder, 6 pounder, and 5 pounder were the 3 biggest fish weighted in. Here are a few of the big fish pictures from the tournament. Lake Cooley fishing is pretty good. The big bass are starting to heat up. Try throwing a white super fluke on a jig head. A LuckyCraft jerkbait is the real deal. Fish it over brush piles and over rocky points. This month, a lot of fish are suspended over brush or points. A jig and pig is also working in 15 to 20 feet of water. The crappies are biting a little bit so try drifting medium size minnows in the mouth of the big coves. todd huntley has not filled this section yet.